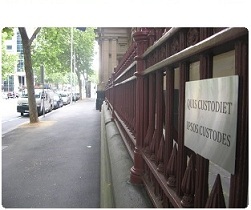 Edit: Contempt proceedings in Victorian courts are (fortunately) rare. One past instance is Anissa Pty Ltd v Parsons  VSC 430. Cummins J's decision is interesting for the story it tells and the law it applies. A magistrate has imposed one month's imprisonment for contempt of court to an accused who blew and popped a chewing-gum bubble at him. Magistrate Rod Crisp described the bubble-popping as an act 'calculated' to demonstrate disrespect for the court, the Age reports today. The contemnor had been seeking an adjournment of unrelated matters at Moorabbin Magistrates' Court. He pled guilty to contempt in the face of the court soon after, and was sentenced immediately. He was released by the Supreme Court last night pending an appeal. The 'Crisp Show'. Enough is enough time to retire Rodney! !